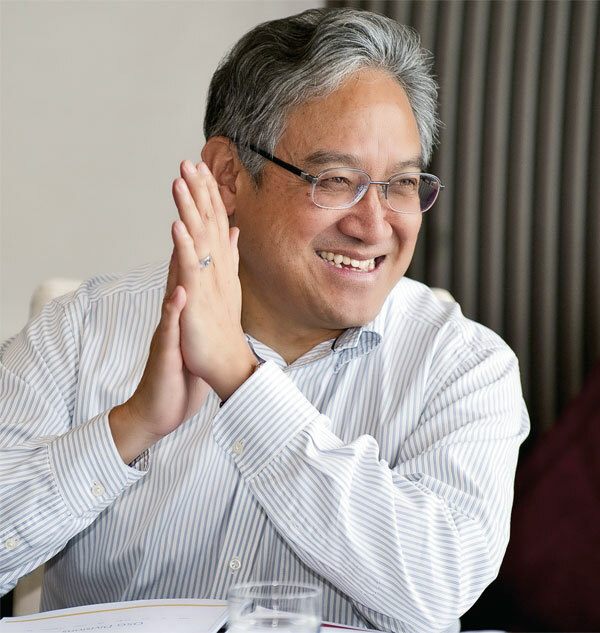 To keep pace with a fast-changing global business environment, “You’ve got to institutionalize the process of reinvention,” says William Fung. Photo courtesy Li & Fung Ltd.
Look in any closet, toy chest, or family room in a typical Western home, and you’ll find a trove of goods supplied by a century-old Hong Kong–based export trading company— Li & Fung Ltd. Odds are, you’ve never heard of it. The company name doesn’t appear on the goods it delivers. But nearly every major retailer, from Liz Claiborne to Walmart, depends on Li & Fung to stock its shelves. The firm is the quintessential middleman between manufacturers, now in more than 40 economies, and global consumers. It owns no factories yet orchestrates the entire supply chain, from purchasing thread to delivering finished goods complete with price tags to individual stores. William Fung (MBA ’72) and his older brother, Victor (PhD ’71), who taught at HBS for four years, are the third generation to lead the firm started by their grandfather in 1906. When they returned to Hong Kong from the United States in the 1970s to work side by side with their father, the company’s future was uncertain. Under the brothers’ guidance, Li & Fung today is a global leader in consumer goods design, development, sourcing, and distribution, with revenues exceeding $16 billion. On a recent trip to the firm’s New York offices, William Fung, executive deputy chairman, took time out to talk about past challenges and the brothers’ unique approach to managing the company. When you and Victor returned to Hong Kong to take over the family business, did you ever dream that it would become a multibillion-dollar powerhouse that stocks the world’s major retailers? We didn’t think of it that way. All we thought about was how to make it better. Maybe more apropos of the time—how to survive. Things were changing very rapidly even then. And we knew that if we didn’t at some point change or reinvent the business, it would be history. Every generation of my family went through some kind of a major business crisis. My grandfather started the company in 1906 in China selling chinoiserie goods, porcelain, silk, and tea. That’s what the West wanted at that time. He built his business up that way, and he prospered. But everything came abruptly to an end in China during World War II. We could very easily have just faded to oblivion as a company, but my father took over, moved the company to Hong Kong, and reinvented it. The British had founded Hong Kong as an entrepÃ´t to China. After the Communists came to power in 1949, Hong Kong had to transform itself as a manufacturing center, and our company changed to one of exporting what Hong Kong produced. It built its reputation exporting labor-intensive consumer goods that are still the basis of Li & Fung’s business today. What issues did you face when you returned to Hong Kong in 1972? Was there a turning point in your thinking about how to manage and grow the company? The turning point was when Deng Xiaoping opened up China, making available the most important natural resource it had, its labor, to the rest of the world. Starting in 1979, China began to industrialize and create the economic miracle that everybody now talks about. In a short space of 30 years, China has transformed itself radically and become a major factor in the world. Victor and I saw this abrupt change as the beginning of a golden age for a trading company like Li & Fung. The company recovered its roots in terms of our expertise in supplying the West with Chinese-made goods, which is what we used to do in my grandfather’s days. Li & Fung has thrived as a low-cost export-driven company. Will that continue to be your business model? No. We actually think that China will not be as cheap as before. Its new five-year plan calls for average minimum wages to go up 13.5 percent a year. That’s an 82 percent increase in wages over five years. Higher wages will cause China’s growth engine to transition from low-cost exports to domestic consumption. My prediction is that over the next 30 years, China will become the world’s largest consumer market. So the future of Li & Fung is selling to the Chinese market, not just sourcing manufactured exports from China to the West. In fact, we expect to expand into selling to India as well. Those are the new markets of the world. How do you make big, strategic decisions like turning to Chinese and Indian consumers for future growth? At Harvard Business School we were taught about rolling plans; every year you change. We actually think that’s a bad idea. We tried rolling plans with our company, and we found that managers never focused on the long-term because we changed plans every year. When you move the goalposts all the time, people don’t pay attention to long-range plans. Actually, we learned something about planning from the Chinese central planning system. They work on five-year plans. The plan doesn’t change, and you work like hell for five years to reach it. For us, five years is too long. Three years is better because the world changes so rapidly. So every three years, we basically reinvent ourselves, or try to. My brother calls it a process of institutionalizing change. You’ve got to institutionalize the process of reinvention. We’ve used this system since 1992, and our average compounded growth rate over that time has been about 22 percent. Acquisitions have been an important part of your growth strategy since the mid-1990s. How do you manage to fold an acquired firm into Li & Fung? To be bigger, we obviously need to have management layers, but we need our managers and our profit centers to be as flexible as the small companies they’re competing against. So that led to a system where we operate more like a partnership than a very structured, bureaucratic company. It’s a very flat organization where people are empowered, and they are compensated to be very entrepreneurial. That whole culture carries over to acquisitions. We understand that when we acquire a trading company, we are acquiring the people. Frankly, a lot of the customers they have are probably common customers to us. Everybody sells to Macy’s, and Walmart, and JC Penney, right? So we’re not acquiring the customer list. We’re acquiring the people and their expertise that allows them to sell to those customers. So we don’t get rid of people in a hurry. As a global firm, do you have a single company culture or different cultures at each location of your operations? Culture for us is very important, but it’s a culture that has to be evolving and open-ended. For example, when we make an acquisition, the acquired company might have different types of behavior from us. We should always be open to that. But we’re not open to the extent of having many different company cultures. If we have 10 acquisitions, we don’t want 10 different cultures. What I want to do is say, look, this is the Li & Fung culture, Mr. Newcomer. You look and see what works for you. If there’s something that you think doesn’t work, we have to talk it through and explain to you why it worked for us. Maybe you’ll change your mind. Or if you have something that really works, I’d like to learn about it. And if I like what you do, I’ll change the culture of the whole company. We evolve the company culture based on the new input. What are the characteristics of the leaders who help make Li & Fung successful? They must be people-oriented. They must want to engage with people, whether it’s their own staff or the customers’ people. Customers come to us not to buy one product but to do a whole relationship. So we tend to focus on people who know how to deal with other people. Another long-held belief in the company is that when we hire people, we always hire for attitude. We don’t hire for skills. We hire for attitude because we feel skills can be taught and trained. But if you have the wrong attitude, no matter how skillful you are, you’re not going to fit in at Li & Fung. What did you learn at HBS that helped with your business career? The HBS approach to case studies and the analytical frame of mind that they teach are invaluable. My whole analytical framework came from Harvard. Now, what didn’t work very well for me was everything dealing with human behavior and organization. A business, like any other organization, is actually part of a community. And it cannot differ in terms of behavioral norms from the community you’re operating in. Like any American business school at the time, the only thing that Harvard could teach me was how to operate in the American community. But that approach didn’t work so well when I got back to Asia. There, the sense of individualism is much less. The sense of units—whether it’s a family, or a company, or a country unit—is much stronger. I really learned that from my father. He taught me that the way a company treats its people is how the people will treat the company. So it’s a mirror; it’s totally different than in the West. Any advice for American business schools? I really believe that a new social contract has to emerge between businesses and the communities where they operate. In the old days, under the market-driven mentality, the idea was that the government sets the framework within which businesses can work, right? And within that, businesses should maximize profits. That’s their role. But I think what has happened recently is that people are saying that the framework is not perfect and that government is not doing a good job. Plus, in many countries, government and businesses collude to change the framework, allowing companies to set their own boundaries. A new social contract needs to be developed, because especially in the last few years, business has made such a bad name for itself. Corporate social responsibility is hugely important. It’s not enough just to maximize profits. You’ve got to look at the short term versus the long term. People are now much too short term. And short-term profitability and long-term profitability will engender very different ways of working.